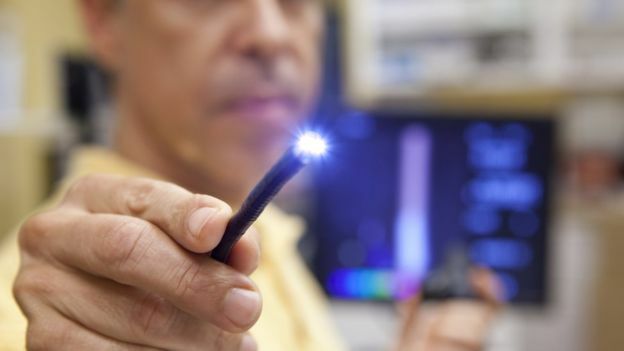 The new camera works by detecting light sources inside the body, such as the illuminated tip of the endoscope's long flexible tube. Prof Kev Dhaliwal, of the University of Edinburgh, said: "It has immense potential for diverse applications, such as the one described in this work. Researchers have developed the new camera so it can be used at the patient's bedside. The project - led by the University of Edinburgh and Heriot-Watt University - is part of the Proteus Interdisciplinary Research Collaboration, which is developing a range of new technologies for diagnosing and treating lung diseases. Dr Michael Tanner, of Heriot-Watt University, said: "My favourite element of this work was the ability to work with clinicians to understand a practical healthcare challenge, then tailor advanced technologies and principles that would not normally make it out of a physics lab to solve real problems. "I hope we can continue this interdisciplinary approach to make a real difference in healthcare technology."